Winter is fast approaching and you have been planning to buy a pair or two of the best women’s snowboard boots for the whole season. The continuous rise of the terrific range of snowboard boots for grabs in the market today only leaves you the daunting task of choosing the right one amongst the rest. What are you going to do now? Why not answer the following questions first before even trying on your first pair. 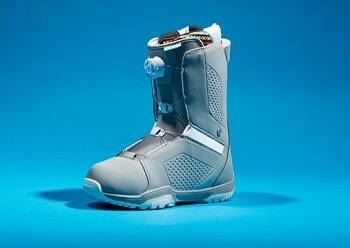 How much can I spend on a pair of snowboard boots? How often will I use snowboarder boots? How many days will I be riding this winter? Splurging on a pricey pair does not make any sense when you only use the boots once annually. It would be better for you to consider the retention of their quality during the season and beyond. Whatever your choice of snowboard boots, it remains best to visit your local shop to get informed of the right type and sizing for you. Shop staff will ensure that you are making your most informed decision when it comes to their flexibility, features and fit. This approach will help you get an idea of the best brands you like as well as the sizes you need to work out. But before heading to the brand selections for your next snowboard boots, there are other significant factors you need to consider first. What makes snowboard boots the best depends on your purpose for using them. To help you with this venture, keep the following important things during your selection. Have your preferred riding style in mind before buying snowboard boots. Rigid boots that can generate edge power for snow line slicing would be best if you are like a backcountry line slayer. Soft flex boots are perfect if you are a freestyle rider who loves jibbing, tricks, and jumps in the park terrain. Take note that boots flexibility can be categorized into soft-flex, medium-flex and stiff. Choose the boots that are specifically designed for you, one that is fit for your size. Women’s boots are customized based on their anatomical needs, such as their smaller footbeds and narrower heels. Liners have a significant effect on how the boots feel on your feet. High-end boots are made from heat moldable foam, giving you optimal feel and custom fit. Other boots have ankle harnesses, closure systems, or removable J bars which helps lock ankle for additional flexibility. Boots with removable liners is great for your days of boarding. The best lightweight and shock absorbent materials will not jack unless your boots fit on you properly. Comfortable boots helps prevent cramped feet, crush toes and sore heels caused by heel lift. Comfort is dependent on their sizing and on whether they fit your feet properly. Just like in many other cases, the right lacing system can make or break snowboarding boots. Boots comes in various lacing systems, each of which has its respective advantages and disadvantages. Boa lacing system – The lacing system that is simple and provides you with convenience as it only requires twisting of cable reels to tighten up. Traditional lacing system – It provides whole day proper use once the lace is tightened and properly adjusted. Speed lacing system – It is specifically designed for speed and requires minimal time during the cold windy weather, getting more things to do. There are still possibilities for boot bindings to wear around whatnot and lodge although they can cover up a huge portion of the boots. In this case, it is highly recommended to choose based on comfort and functionality followed by their appearance. With these considerations in mind, you are now well prepared to peruse the following women’s snowboard boots to find the best for you to use. Whether you are in need of a comfortable, flexible boots or a super supportive boots for big stomps and air, there is a pair of boots that suits you right. Here are some of the latest product selections in the market for you to choose from. Description: Adidas Mika Lumi remains the only women’s boot dominant in their range, also attractive to riders with its versatility. Its 3D molded tongue offers longer lifespan and extra comfort. It provides you comfort fit as its speed lacing system is split into lower and higher sections. This direct liner lace system secures your heel and locked it down to reduce fatigue and to have better response. Its improved lightweight construction with an EVA sole promises no other than an all-day cushioning with lesser bulk. Recycled coffee-ground materials of the boots give odor neutralization to keep the snowboard boots from being too funky. The boots all have the necessary features for women users, but it is recommended to also consider other types of boots from Adidas so you will know which pair fits you perfectly. That is to say, that caution should be considered, as many unscrupulous marketers now emerge in the sector especially in online commerce. DynoGRIP Outsole featuring rubber heel and toe, sleeping bag reflective foil and B3 Gel that offers cushioning. Description: The Burton Emerald Snowboard Boots are referred to as the girl’s best friend since they are more valuable when compared to a diamond at their pristine condition. They can literally thrive in terms of their progressive and forgiving flexibility. They are even versatile when used in mountains. The tongues are reshaped for a 1-to-1 fit, which is available in every size of the boots. They also come with internal gusset construction to seal the boots’ lower zone, keeping your feet dry and warm during the winter season. Their exclusive construction gets rid of the break-in period, offering a total comfort from day one to day 100 of usage. Cold days would not be that worrisome for you as their 3M Thinsulate Insulation will help you keep warm as well as protected from any kind of elements. These boots will surely make your skills in snowboarding shine without hurting your wallet. If you think Burton Emerald Snowboard Boots are not the best for you, you might consider another pair from Burton featured below. Description: Burton Bootique Snowboard Boots are unique with their very soft and tender touch alongside their inviting flexibility. The smoking looks of these boots matches their all-around performance. This provides you with fast lacing control that could be likened to lighting. It also provides more power, increased wrap and improved response without exerting much effort. The very curve of your feet is fitted right through their heat-moldable liner and Speed Zone laces. Your infatuation to this pair of boots will further considering its low-profile EST midsole that is gelled with B3 cushioning that also offers great dampening to withstand impacts with no breakage. The Flex Spine Backstay of its soft-flexing shell materials offers you lateral and medial mobility with edge-to-edge support. Progressive flexibility of its upper tongue construction is attributable to its Stay Puft Tongue for smooth forward motion and comfortable cushioning. There are also other snowboard boots under the brand of Burton that you may look into if you still don’t feel this one. Description: DC Karma snowboard boots are referred to by many women as awesome primarily because of their distinct style and comfort features. Their traditional lace system and functions offer good feeling. They are among the eye-catching boots, but not that expensive to purchase. They are even considered as one of the most inexpensive models in the boots market these days. The outer shell lacing part of these boots are kept classic while their liner boasts for simple speed lace, giving you snug fit with less fuss. Meanwhile, their outsole is lightest among the rest. These boots can be used anywhere and will make you recognizable due to their medium flexibility. Their EVA foam footbed helps alleviate shocks caused by hard landings while their moisture-wicking fabric tends to keep your feet cozy and warm. They are also available in other colourways. DC Karma can be both good and bad depending on how you use them. Size – 8 B(M) U.S. Description: Having difficulty in your boot laces? 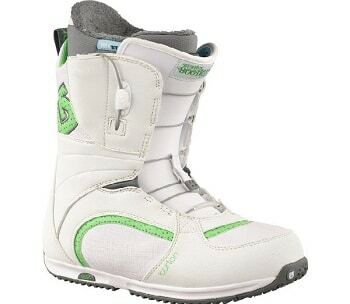 Why not choose DC Women’s Misty 2011 snowboard boots for your next pair. It only takes you a single pull so you will be perfectly set to tackle any part of the field or mountain to ski or snowboard. This guarantees you fast in and out lacing system, allowing for an easy on-hill tightening as well as adjustment while locked. There are also those who find the lacing system difficult, but not really a major issue in their overall performance. The outsole of these snowboard boots provides you with your much needed traction and durability, along with a lightweight feel. Women with narrow foot find them perfect for their feet, giving them comfort and warm feel. They noted that these boots are true to their size and width as expected by DC’s customers. Get yourself in DC Women’s Misty boots and experience comfort and convenience in a single package. Description: If comfort is your main concern in buying snowboard boots, Deeluxe Ray Lara CF Snowboarding Boots is there to provide you with much convenience you need. This pair of snowboard boots provides snug heel pockets, easy lacing systems, and anatomically correct features from top to bottom, spring nothing from its predecessor 2008 collection. Even its smallest features of toe box and women-specific tighter heel pocket can take women into a serious riding. It invites you to challenge your own personal endurance as it guarantees that your classic powder days will not end with discomfort. Never worry about bite on your heel as its Soft Back Cuff gives you comfort. Its Fishbone Outsole provides traction zone fluency with high quality EVA Midsole gripping rubber, making it insulating and lightweight. Overall, it is a nice pair for women with little precaution on its sizing as sizes tend to be off by 2, but it’s still easy to put on. Description: Flow Hyku Coiler Women Snowboard Boot allows you to stay comfortable throughout the day. You may go stiffer if you are keen to goggle up halfpipes or powder faces, but this remains the job if you are looking for fun at slower pace of speeds. The Boa lace system of these boots allows you to have instant adjustment and full-on loosening when you need to stop by for lunch. Its outsole is forgiving and malleable, while its molded EVA insole only offers mega comfort. The 3D molded toe box is specifically designed to eliminate additional seams and layers around the boots’ top, lessening their bulk while durability is being added. A silicone screen print of their EVA Dual-Density gives traction for ultimate hold of their heels. With all the significant features of these boots, most users highly recommend them to friends. If you think Flow Hyku Coiler Women’s Snowboard Boots are not the one for you, you can still go for the other boots reviewed here. Description: Northwave Opal SL Women’s Snowboard Boots is the boots that matches your style if you are into an all-mountain ride. This pair of boots promises to provide you high performance with its comfort and power for an excellent day in the mountain. Its Thermo-Fit Foam Liner helps mold the curve of your feet so you will get the best customized fit. It has webbing liner system that aids in power transmission distribution across to get the most of it downhill. The EVA footbed at its TF2 base serves as a shock absorber and keeps your feet insulated against cold weather when you are having fun time at the park. Its Super Lace SL System functions well when two different parts of the boots are closed, giving your great feel with stability and comfort. Walking from the parking area to the life and beyond is made safe with its HyperShock outsoles. Some women may not be favorable on its black color, but it is actually available in pink for the fashionistas. Northwave Opal SL Women’s Snowboard Boots is very much concerned with direct foot-to-board feel, control and comfort once you slip your feet into these snowboard boots. As a rule, buying snowboard boots should be your first move when planning to assemble a board-boots-binding setup. Make sure that your snowboard boots fit you comfortably so you will be able to move to bindings and make yourself a great match. More than a board, boots allow you to splurge a bit if you can to make sure that you get the right fit. The review of the women’s snowboard boots above will be your guide in acquiring your own boots. Remember, your chosen boots should be matched to your frequently encountered snow conditions and your usual riding style. Take note of their variables that includes their liners and footbeds, lacing system, comfort and fit, and flex and riding style. There is no wrong in choosing the snowboard boots listed above if you select the pair that satisfies all your requirements for boots. Are we effective in giving you guidelines for boots selection? Is there anything else you would want us to include here? Let us know with your comments then. Best Sport Sandals: A Walk in the Park!